AXON Type 43 Gate Valves are designed especially for harsh environments encountered during frac, snubbing, or work over operations. 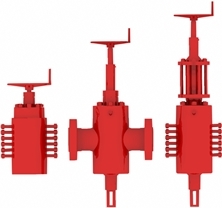 The valves are compact and lower in weight than similar gate valves in the market. In addition, the unique gate design minimizes damage to seal surfaces, resulting in increased performance and reduced valve repair cost. Bore sizes: 4-1/16", 5-1/8", and 7-1/16"